Would you like chickens with that? 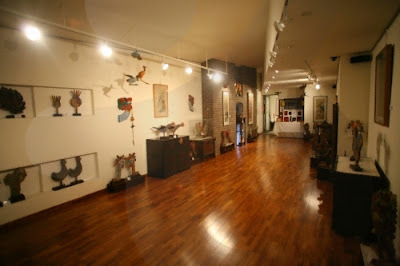 : Seoul Museum of Chicken Art - yes, really!! Oh my god!! You couldn't make this stuff up! Not only has Seoul given us Gangnam Style (I find Psy quite charismatic, love him), yes, there is also a museum dedicated to all things chicken. From its official website: "Located in Bukchon, the Seoul Museum of Chicken Art is a private museum that opened in December of 2006. With a theme of the fowl in both the East and the West, the museum exhibits crafts expressing ideas of the chicken through different contexts of culture and art. In Korean, the museum is actually called a Culture Center of Chicken Art. This means that it has on exhibit, all artwork related to chicken, regardless of when or where they come from and by whom they were made. The curator of the museum hopes that it will become a space for sharing, learning, and feeling."